“We again wish to report on the seeding of humanity and the nine events. The struggle and strife your world faces today and in coming days will take one on a magical journey of awareness of self. These nine events are necessary processes to coalesce humanity back to the Oneness many now seek. This Oneness is part of the necessary form of being for all. Knowing that Oneness exists is yet another step towards the Truth of re-membering. 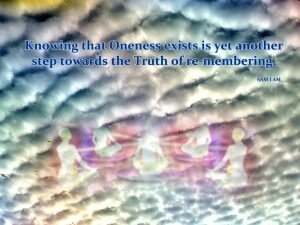 Knowing of the truth of Oneness brings all aspects of the Whole of One together in spiritual awareness, together in conscious awareness as all relate to the confusion and chaos of what seems to be another. “We the White Winged Consciousness of Nine are here to assist humanity out of this realm of separating thought forms. These thought forms have served their purpose to enrich the experience of each aspect of the Whole of One wishing to experience a journey seeming to consist of separation. The journey is not quite ended in your vernacular. It will continue for hundreds of years. Yes, we know that may seem quite arduous to many humans but please recall, as a human form those currently in human form will not recognize the fruition of this grand event in their current thought form. Recall, all within your earth is a thought form and these thought forms were seeded along with the seeding of the earth. As your New Earth continues to cement and enrich itself, these thought forms must be dissipated with the other so-called negative thought forms that built and held the earth of old, for humanity will not carry these energetic thought forms into the New Earth. “Be aware many humans now in form will never consciously or unconsciously enter your New Earth. Know that those holding the energetic thought form of Oneness are now on this new 5D earth. As this earth continues to evolve and enrich itself, all those upon her shall do the same. Know that in coming months the chaos and turmoil within what seems to be your New Earth is really the vestiges of the thought forms of the old earth trying to take hold. It is important to dissipate these thought forms, to no longer carry these thought forms, for your New 5D Earth will not support them. Those persisting in relishing in the energies of these thought forms of separation will continue to leave your world. Those continuing to relish in the separation of humanity are not recognizing that each thought form within their own physical mind, own physical awareness, is really an aspect of their self waiting to be cleared. This is an important part for all of humanity to pay attention to, the thought forms are in your mind. The thought forms will continue but only with your constant thoughts of their awareness. Once you lay aside the thought forms of separation, the thought forms of Oneness cement within your vernacular and all becomes One in Truth, in Love, in Light.